How tragedy can destroy what was once a seemingly perfect family is exquisitely realized in this heartbreaking drama. As the story begins, we are placed in the middle of a family in the affluent surroundings of Lake Forest, Illinois. They’re struggling to come to terms with the death of their oldest son in a boating accident roughly a year after the fact. Flawless ensemble piece is a stunning achievement of acting. 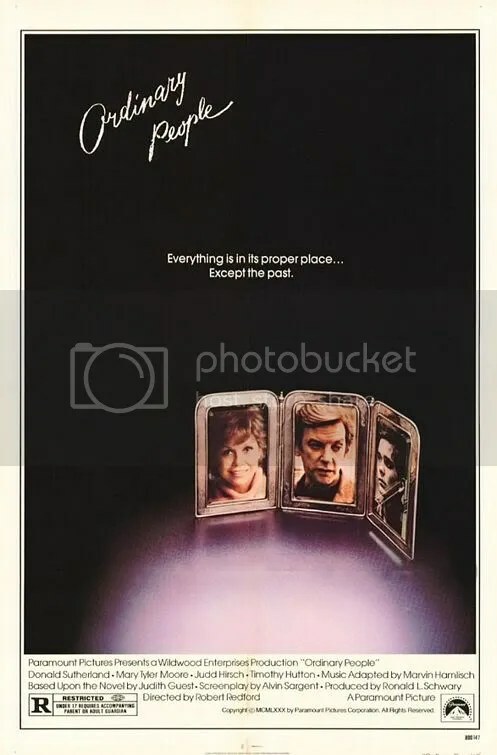 Timothy Hutton, in his film debut, won the Academy Award as the guilt ridden younger son who cannot absolve himself from the responsibility he feels over the incident. Donald Sutherland matches him as the passive father unable to keep his family from unraveling right before our eyes. But the most startling performance of all was that of Mary Tyler Moore as Beth Jarrett who seems more concerned with keeping the facade of a stable family life than dealing with the inner demons of her younger son. It is a shocking cast against type to anyone familiar with the personality on her TV shows. The somber mood is most affecting because the raw emotion of these characters is brutally real. We share an intimacy with these people. Rarely has the aftermath of a child’s death been handled with such honesty. This entry was posted on February 1, 2011 at 8:00 pm and is filed under Drama with tags 1980. You can follow any responses to this entry through the RSS 2.0 feed. You can leave a response, or trackback from your own site. What a great movie. A real acting tour de force. Can’t believe I waited so long to see it. Dramatically, no dispute: dialog and characters right on the money, and, as you point out, MTM’s performance really special. As far as subject matter though, pictures like this — “Shine” and “Frances” are a couple of others that come to mind — make you wonder what you’d think if the writers had chosen to tell the story from the OTHER person’s point of view — Mom in this case and “Frances”, Dad in “Shine”. If that oh-so-sensitive-and-sincere Sutherland character had made a quarter of the effort to help his wife through HER difficulties as he did with his much-more-annoying son, he would’ve kept his whole family together — not to say that’d be much of a bargain for Mom. So glad you saw this and loved it like I did. I’ve seen it several times and emotionally it gets me every time.